In this post we will discuss generating functions. Generating functions are a powerful tool which can be used to solve many problems both in combinatorics and also in analysis. Let denote the set of all sequences of real numbers. For all we let denote the sequence which has value for its th term and all its other terms are zero. The symbol 1 stands for the sequence . Also for any real number we define the product of and a sequence as . We let two sequences and be equal if for all . We define the sum of and by the sequence and the product by the sequence where . Clearly the sequence is equal to the sequence which we will also denote simply by . Note that here stands for the sequence obtained as a product of and 1, i.e. . Algebraically speaking , equipped with these operations, is an -algebra. More importantly there is an analytic viewpoint of also. Readers who are familiar with the theory of power series can consider the elements of to be power series, i.e. each element is basically a function with its domain an open interval (or simply ). By standard theorems in analysis, if and both converge for then for all such , if and only if for all $i$. Hence the approach of considering as a purely formal object may be considered equivalent to considering it as a power series. However, we will soon see as to why convergence issues do not play any role in our context as long as the power series converges for at least one non zero and there is more value in interpreting as simply an element of . Let be a real sequence such that the power series converges for at least one non zero . Then the function which sends such an to the power series is called the generating function of the sequence. We frequently abuse notation and refer to the value of the generating function at some non-zero point as the generating function (which is akin to referring the function as ). Let be the constant sequence of one’s. It is well known that for any real number , if the series converges to . So the generating function of is where for all at which the series converges. The reason for requiring convergence at a non zero point is as follows. As soon as we have convergence at a non zero , by a theorem of analysis it follows that there is convergence in an open interval around . Now, has a unique power series expansion in that interval and so we are guaranteed that there is a one-one correspondence between the purely discrete object thought of as an element of and the generating function . This can be exploited in the reverse direction, for if we wish to recover our sequence from the function , then since is defined by there is absolutely no ambiguity, and we cannot get back any other sequence. In fact, we may say that our sequence has been encoded within the definition of , as a closed form expression . If convergence was only given at , then such a one-one correspondence is not possible, since any closed form analytic function , which is at would become the generating function to the sequence . So for any sequence we will consider its generating function to be defined by as long as there is a non zero $x$ for which there is convergence, and once we have done that will not bother about any convergence issues at all. The reader may be wondering what was the point of giving an algebraic approach initially, for a generating function really seems to have to do more with a power series. Furthermore in the notation of the first paragraph when we were considering a sequence as an element of we gave found that in our algebra is nothing but . This was not a power series but simply our notation for a sequence. It may appear confusing to have the same notation for two different objects, but it has been deliberately adopted for a very good reason. During our computations, we often manipulate our series so that we may no longer be sure whether convergence of a given series at a non-zero point is guaranteed. This poses a mathematical problem of the validity of our operations. However our ambiguous notation comes to our rescue at that instant, for what we really are doing at that point, without explicitly saying so, is not dealing with the series . Instead we are manipulating the sequence with which there are absolutely no concepts of convergence attached. Of course if we need closed form expressions or some other analytic properties have to be established we need convergence so that one can use the one-one correspondence between the sequence and the generating function and dive in the world of analysis. In this way, a constant interplay between the discrete world of sequences and the analytic world of sequences brings out the real power of generating functions. One of the important results in linear algebra is the rank nullity theorem. Here I am going to present a proof of it which is slightly less known. The reason I like this proof is because it ties together many concepts and results quite nicely, and also because I independently thought of it. The theorem (as is well known) says that if are vector spaces with and a linear map then . In this proof I will further assume that is finite dimensional with dimension . A more general proof can be found on wikipedia. We start by fixing two bases of and and obtain a matrix of relative to these bases. (Each is a row matrix). Then our theorem basically translates to . We let and claim that . Clearly if then and so so that each is orthogonal to . Hence . Conversely if then so that , i.e. following which . Now it only remains to invoke the result for any subspace of an inner product space to conclude that . In other words . This post is concerning automorphisms of graphs, which quantify the symmetry existing within the graph structure. Given two graphs and , a bijection which maintains adjacency, i.e. , is called an isomorphism and the graphs and are called isomorphic. Clearly isomorphic graphs are essentially the same, with the superficial difference between them on account of different notation used in defining the vertex set. A isomorphism from the graph to itself is called an automorphism. It is easy to see that the set of all automorphisms on a graph together with the operation of composition of functions forms a group. This group is called the automorphism group of the graph, and is denoted by . In the remainder of this post we investigate some well known graphs and find out their automorphism groups. The first graph we take up is the complete graph . Any permutation of its vertices is in fact an automorphism for adjacency is never lost. Its automorphism group is therefore . The next graph is the complete bipartite graph . First consider the case . The vertices in the first partite set can be permuted in ways and similarly ways for the second partite set. Corresponding to each of these limited permutations we get automorphisms because adjacency is never disturbed. On the other hand, no automorphism can result from swapping a vertex from the first partite set and the second partite set because unless such a swap is done in its entirety (i.e. all the vertices from the first partite set swap places with the vertices in the second partite set), adjacency will be lost. A swap can be done in entirety only if which is not the case we are considering. Hence no further automorphisms can result. Moreover by the multiplication rule it is simple to observe that the automorphism group would be isomorphic to . In the case of , we first pair off the vertices in the two partite sets against each other. This is also an automorphism, say . Now for each of the ways of permuting vertices within partite sets, an additional automorphism arises. It is obtained in this fashion: After permuting the vertices within the partite sets by the particular way we swap each vertex with its pair in the other partite set. Clearly this yields automorphisms and furthermore no more are possible. Since every element of can be written as a unique product of an automorphism collection of the type covered in counting the first ways (which is not hard to see is a normal subgroup, being of index 2) and of the subgroup so we see that the automorphism group is . The next graph we take up is the cycle graph . Firstly note that any automorphism can be obtained in this way: A given vertex may be mapped to any of the vertices available (including itself). As soon as that is done, an adjacent vertex to has only two choices left: it can either be in the counter clockwise direction to or in the clockwise direction to . Once that choice is also made, no other choices are required. Hence we get automorphisms this way and there can be no others. Also, it is clear that two kinds of automorphisms suffice to generate this group: rotation, and swapping the notion of clockwise and counter clockwise (assuming we draw the cycle graph as equally spaced points on the unit circle; there is no loss of generality in doing that). But both these automorphisms also generate the dihedral group which also has elements. It follows that . The final graph we take up is the well known Petersen graph. Instead of directly considering what possible functions are there in its automorphism group (although such an approach is possible) we approach the problem through the concept of line graphs. Definition: A line graph of a graph is the graph whose vertices are in one to one correspondence with the edges of , two vertices of being adjacent if and only if the corresponding edges of are adjacent. Lemma 1: is the complement of the Petersen graph. Proof: It is clear that if the vertices of are labelled then its 10 edges are the 2-subsets of . The line graph thus has 10 vertices, labeled by these 10 2-subsets . Two vertices are adjacent in iff the two 2-subsets have a nontrivial overlap. The complement of is the graph with the same 10 vertices, and with two vertices being adjacent iff the corresponding two 2-subsets are disjoint. But this is the very definition of the Petersen graph. Lemma 2: is equal to . Proof: If then for any two vertices we have , i.e. , i.e. so that . The reverse implication follows by replacing by . Theorem 3: The automorphism group of the Petersen graph is . Proof: In view of Lemma 1 and 2 it suffices to find out for the automorphism group of the Petersen graph is going to be the same. We let have the vertex set in the sequel. Take any automorphism of . If we have two edges with , then either of two cases arise. Either or not. If then obviously and so by injectivity of we have . If then it must be that . This means that and again by injectivity we have . What this means is that the function induced by on in the natural way is injective. It is also surjective as for any clearly . Finally, this function is an automorphism since clearly implies and is implied by as there is a common vertex. As our definition of the induced function is obtained in a definite way we have shown that every automorphism of induces a unique automorphism of . Moreover, it is easy to see that if are two automorphisms then the automorphism induced by is the same as the automorphism induced by composed by . We now show that given an automorphism of we can obtain an automorphism of which induces it in the natural way. Let . It is easy to see that the 4-cliques of originate from the stars of . So has exactly 4-cliques, say where contains 4 vertices corresponding to the 4 edges in that are incident to a vertex in . Since is an automorphism it sends 4-cliques to 4-cliques. Also, must send two different 4-cliques with to different 4-cliques, because if it sends them to the same 4-clique then a collection of at least 5 vertices is mapped to a collection of vertices, a contradiction to the injectivity of . So induces a permutation of the ‘s. Now suppose and are two different automorphisms in . Then they differ on at least vertex in , say on the vertex . Now given any vertex in consider the intersection of the 4-cliques and . If is some vertex in then as an edge in is part of stars with centers and , i.e. . Hence the intersection contains only the vertex . Every vertex of arises in this way. So if , then either or for otherwise . Hence every automorphism of induces a unique permutation of the ‘s. Moreover distinct automorphisms induce distinct permutations so that the automorphisms and the permutations can be put in one-one correspondence. Consider an automorphism of the vertices of where if in the permutation corresponding to . Now a vertex of . This is also the intersection of the 4-cliques and and so . This shows that induces as an automorphism. Hence we have shown that . So the Petersen graph has the automorphism group . Initially all holes except the central one are filled with pegs. The player may jump a peg horizontally or vertically over another peg into an empty hole. The jumped peg is then removed by the player. The objective is to finish the game with just one peg left. The aim of this post is to show that there are (at most) ending board positions in brainvita. In other words, assuming the player wins, his last peg left on the board can be only among fixed board positions. The function has the property that for any given way of placing pegs on the board, if a legal move is performed to yield another way then . To see this, suppose that in the way there were pegs at and positions and the hole at the position was empty. A legal move may be performed by jumping the peg over the peg to yield a way where the holes at and are empty and there is a peg at . Clearly the only change between and occurs on account of these three coordinates and . But as in so following which . The same holds if instead of moving a peg to the right we had moved it above, below or to the left. Moreover all this is regardless of the fact whether the way can actually be reached by a valid sequence of moves in the game. Now we define another function by (the no pegs way means is ) and by a similar piece of reasoning conclude that also has the same property enjoyed by . It is also easy to observe that both and are onto functions and so has elements. Next we partition the set as follows. Any corresponds with a pair and so with exactly one among the elements of . 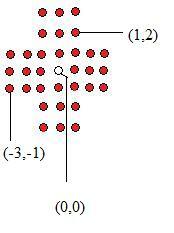 In this way all the elements of are partitioned in parts. Further each part has the curious property that for any in that part, any sequence of legal moves will never change the value of and so the resultant will also be in the same part. It is now obvious that among these parts one and only part consists of all the which can actually occur in a game of brainvita. All other correspond to ways which can never occur in a legal game. What is the value of that this one special part corresponds to? The initial board (assuming it corresponds with ) is set up so that . So any way that arises during the game also has . Assume now that the game has been successfully finished with a single peg at , and that this corresponds to the way . We therefore have . But by definition and . So we must have . Since the multiplicative group is cyclic of order so as a consequence of Lagrange’s theorem we must have . Similarly we have . Combining these facts together we have dividing both and . The only five coordinates which satisfy this condition are and . So the player has to end up at one among these positions. This completes the proof. It should be noted that we have only found an upper bound on the number of positions the final peg can end up at. However by explicitly giving a sequence of moves for each of these coordinates it is possible to show that all these endings are indeed possible.